Limited data is available in the literature regarding the use of magnification for performing SRP. 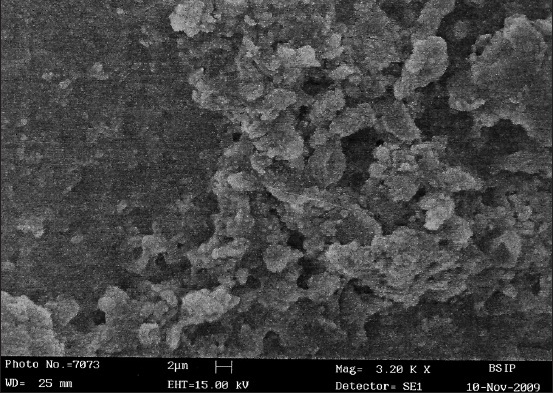 Hence, the present research was undertaken to evaluate the efficacy of supragingival and subgingival SRP with and without the use of ML and DOM, based on the results of microanalysis of root surface post SRP, by scanning electron microscopy (SEM), elemental analysis of root surface by energy dispersive X-ray analysis (EDAX) and micro morphology of root surface by atomic force microscopy (AFM). Study was conducted in the Department of Periodontology. Ethical clearance was obtained from the Institutional Ethics Committee in accordance with the declaration of Helsinki. Patients were explained about the procedure to be performed and the consent was obtained. Detailed case history of all patients was recorded. Supragingival and Subgingival SRP were performed on the teeth to be extracted. A randomized controlled clinical study consisting of 90 human teeth scheduled for extraction from 18 patients aged between 25 and 65 years suffering from generalized chronic severe periodontitis were randomly assigned to following three treatment groups with inclusion and exclusion criteria. Group 3: SRP performed by magnetostrictive ultrasonic scaler (Cavitron, Dentsply) followed by hand instruments with sharp Gracey Curettes and Subgingival Scalers (Hu-Friedy) with DOM of magnification ×3.5, ×5.0, ×8.5, ×13.5, ×20.5 (3D Medical Systems, USA). Teeth without wasting diseases or cervical restorations. Before extracting the teeth, area was marked with the help of a round bur, making a first linear groove at the location of the gingival margin to designate supragingival area, (distance between cementoenamel junction and the marked groove). Teeth were then extracted avoiding trauma to the root surface and were placed in 1% methylene blue for 2 min to stain the attached tissues and second linear groove was marked at the level of junctional epithelium demarcating the subgingival area (distance between the first and second groove). Teeth in three different groups were then placed in normal saline and transported for AFM and SEM along with EDAX analysis. Samples from all surfaces, supragingival and subgingival area were selected and a 1 mm × 2 mm × 1 mm thick slice of each surface and area to be analyzed was cut with the help of diamond disc. SEM and EDAX analysis was carried out. AFM was carried out at Department of Physics, Indian Institute of Technology, Delhi for topographic analysis. 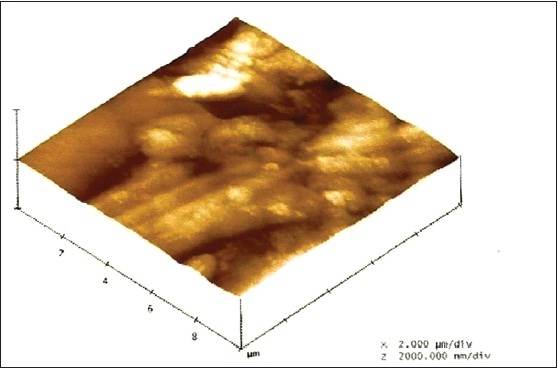 All the images and graphs were obtained by AFM explorer manufactured by Veeco-Thermo Microscopes (USA) with using contact mode with tips from silicon nitride (type 1520-00, Veeco). Maximum measurable changes of the surface profile had been measured for obtaining images with in 10 μm × 10 μm with in the center of each section put on the stage. Sections of all samples were stored in normal saline to avoid dehydration and evaluated by SEM along with EDAX. Photographs of the central portion of each specimen were taken at ×3200 magnification by SEM (LEO 430 USA). SEM examination was performed by a single blinded examiner. 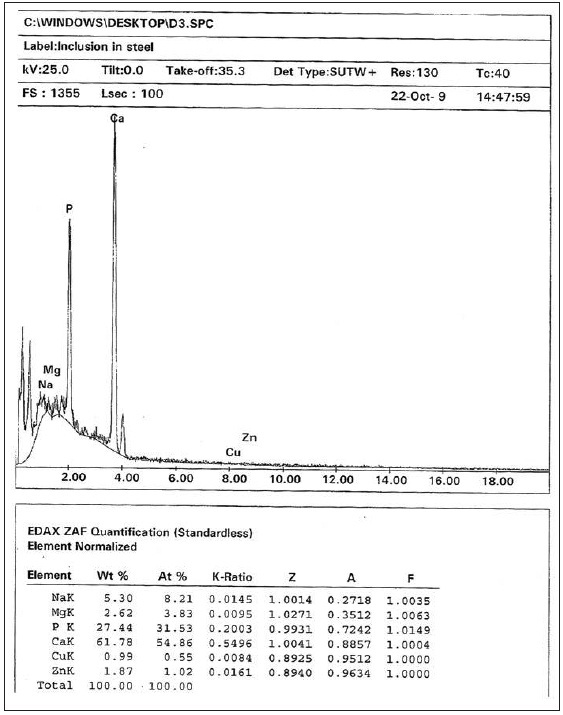 Element analysis of root surface was performed by EDAX. The number and energy of the X-rays emitted from a specimen can be measured by an energy-dispersive spectrometer. As the energy of the X-rays is characteristic of the difference in energy between the two shells and of the atomic structure of the element from which they were emitted, this allows the elemental composition of the specimen to be measured. 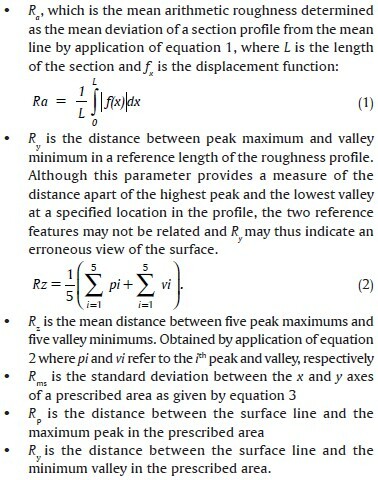 Comparison of mean values of minerals in different groups was also compared with normal root (without calculus - negative control) and subgingival calculus (positive control) values. The parameters evaluated were: Surface morphology (regular, irregular or flaky surface), presence or absence of smear layer, debris, calculus, scratches and the opening of dentinal tubules. Grade III:Presence of visible debris and plaque all over the scanned area; no visible tubuli; and smear layer present on the entire surface. All observations were tabulated by a single observer and were subjected to statistical analysis using Statistical Package for Social Sciences 15.0. The Chi-square, analysis of variance (ANOVA) and Tukey HSD tests were used to compare the within the group and between group variances among the study groups. 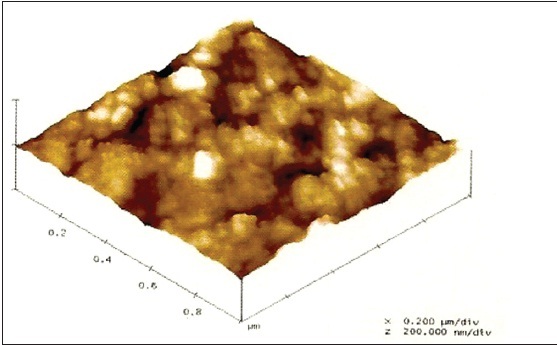 Topographic analysis by AFM of post SRP, unaided group sample revealed the presence of debris, calculus and scratches all over the surface [Figure 1]. 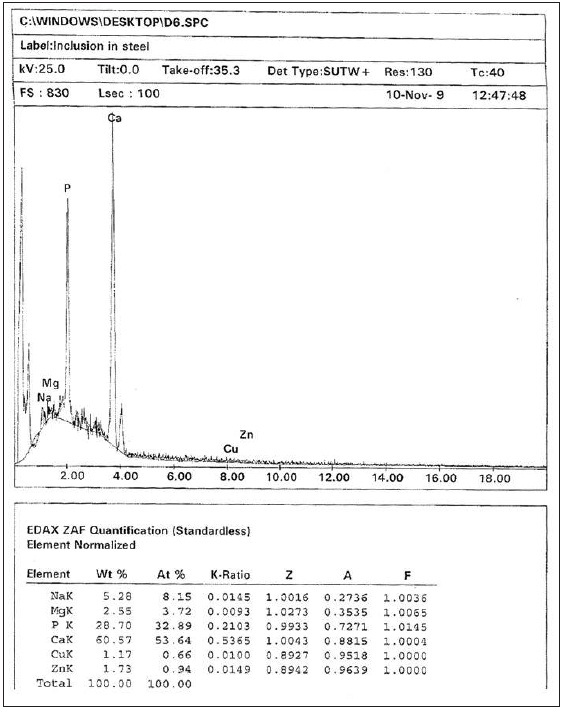 SEM analysis of the same group showed the presence of visible debris all over the scanned area, smear layer present on the entire surface and no visible dentinal tubules at magnification ×3200 [Figure 2] and EDAX analysis revealed maximum levels of mineral contents for magnesium (Mg), potassium (K) and minimum P on the surface in weight% as shown in [Figure 3]. Topographic analysis by AFM of post SRP, ML sample revealed the presence of smear layer with opening of dentinal tubules at some places [Figure 4]. 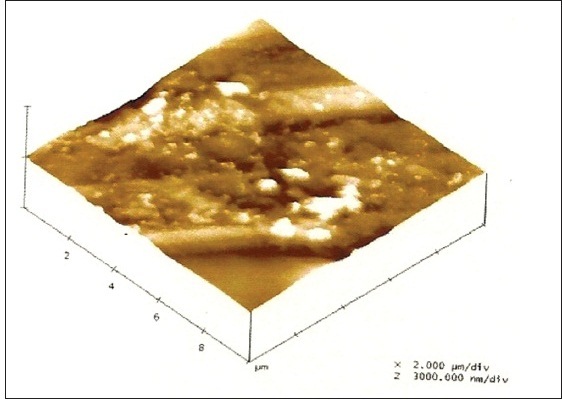 SEM analysis of the same group showed no visible debris, with some opening of dentinal tubules and presence of smear layer on the surface at magnification ×3200 [Figure 5] and EDAX analysis revealed mineral contents on the surface of ML sample in weight% as shown in [Figure 6]. Topographic analysis by AFM of post SRP, DOM sample revealed clear surface with opening of dentinal tubules all over the surface [Figure 7]. SEM analysis of the same group showed absence of visible debris with good exposure of dentinal tubules and no evidence of remaining smear layer at magnification ×3200 [Figure 8] and EDAX analysis revealed complete elimination of diseased cementum as shown in [Figure 9]. EDAX results using ANOVA for mineral levels in different groups is shown in [Table 1], revealing statistically significant intergroup differences (P < 0.05) for magnesium-potassium (Mg-K) and calcium/magnesium (Ca/Mg). 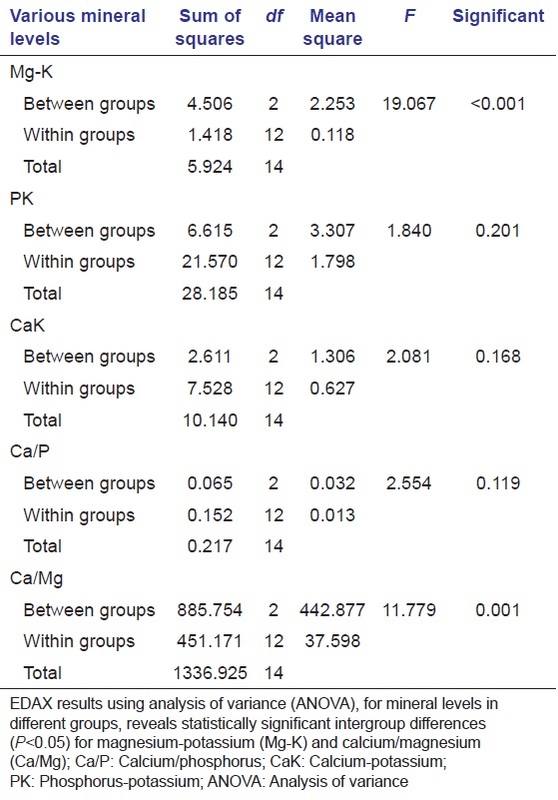 Multiple comparisons using Tukey HSD test in [Table 2], for phosphorus-potassium (PK), calcium-potassium (CaK) and calcium/phosphorus (Ca/P), didn't reveal a statistically significant difference (P > 0.05). For Mg-K, the mean value obtained for unaided was significantly higher as compared to both Loupe and DOM; no statistically significant difference was seen between unaided and Loupe groups. 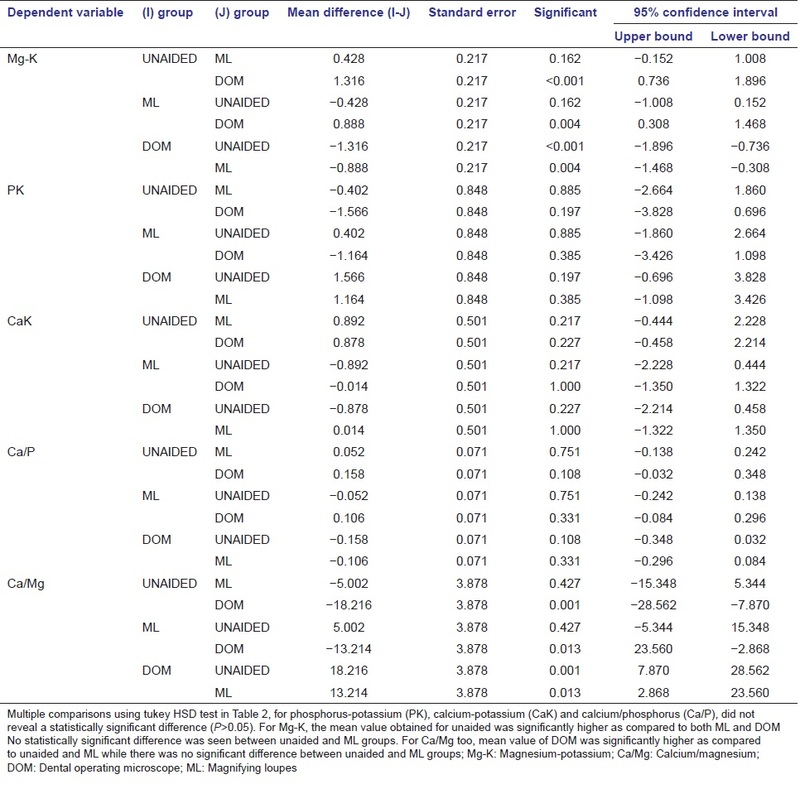 For Ca/Mg too, mean value of DOM group was significantly higher as compared with unaided and Loupe groups while there was no significant difference between unaided and ML groups. One sample t-test was used to calculate significance of difference from controls shown in [Table 3]. For Mg-K, all the three groups had significantly higher mean value as compared with negative control (P < 0.05), the significance of difference was very highly significant for unaided and ML groups (P < 0.001) while for DOM group it was just significant (P = 0.020). As compared with positive control, all three groups had significantly lower mean values. The difference from positive control was highly significant for unaided group (P = 0.003) while for ML and DOM groups it was very highly significant (P < 0.001). For PK, all three groups had no statistically significant difference from negative control (P > 0.05). However, as compared with positive control, DOM group had significantly higher mean value (P = 0.006) while the other two groups did not show a statistically significant difference. For CaK, all the three groups had significantly lower mean value as compared with negative control (P < 0.05), however for positive control, unaided group did not show a significant difference (P = 0.775) while the mean value of ML and DOM groups were significantly lower (P < 0.05). For Ca/P, the mean value of unaided group and ML group was not significantly different from either positive control or negative control. However, for DOM group the mean value showed no significant difference from negative control, but the difference from positive control was significant statistically (P = 0.022). For Ca/Mg, all the three groups had statistically significant differences from both positive and negative controls (P < 0.05). Grade distribution in three groups is depicted in [Table 4]. Entire 240 specimens in DOM group were graded as I, all 240 specimens in Loupe group were graded as II and all the specimens in unaided group were graded as III. There was a statistically significant difference among the groups (P < 0.001). [Table 5] analyzes the efficacy of SRP in mandibular to maxillary arch. 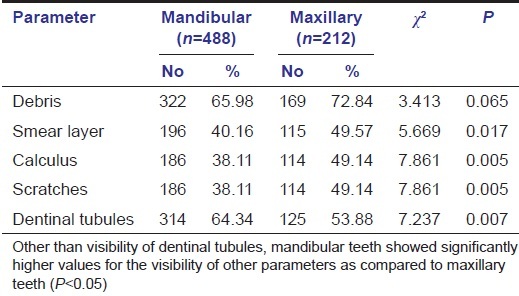 Other than visibility of dentinal tubules, mandibular teeth showed significantly higher values for the visibility of other parameters as compared with the maxillary teeth (P < 0.05). Order of efficacy in terms of the surface was found to be-Palatal < Lingual < Distal ~_ Mesial < Buccal as shown in [Table 6]. Visibility of all the parameters other than dentinal tubules and debris, mesial and palatal surface showed higher values as compared to other aspects (P < 0.05). No significant difference in visibility of debris was seen among different surfaces (P = 0.675). The proportion of Grade I and Grade II results was higher in lingual aspect as compared to all the other aspects while the proportion of Grade III results was higher in palatal aspect as compared to other aspects. 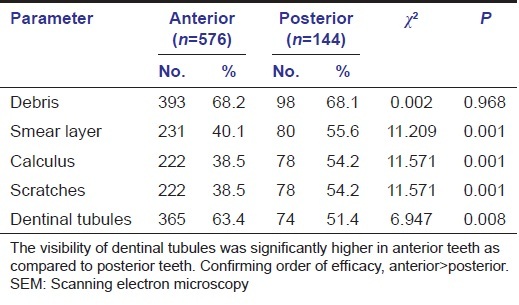 Results of SEM analysis for the efficacy of SRP, in anterior to posterior teeth at ×3200 are depicted in [Table 7]. Other than dentinal tubules and debris, for all the other parameters the visibility in anterior teeth was significantly lower as compared to posterior teeth (P < 0.05). No significant difference in visibility of debris was seen between two groups (P = 0.968). The visibility of dentinal tubules was significantly higher in anterior teeth as compared to posterior teeth. On the basis of above findings, the order of efficacy was anterior > posterior. 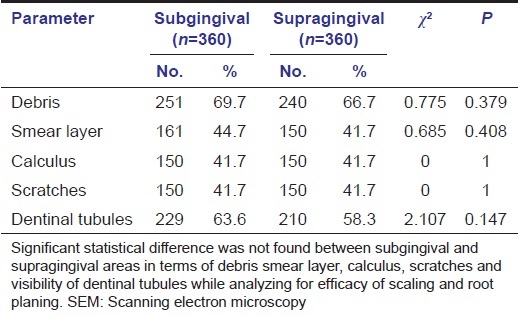 Significant statistical difference was not found between subgingival and supragingival areas in terms of debris smear layer, calculus, scratches and visibility of dentinal tubules while analyzing for efficacy of SRP in the area as shown in [Table 8]. On the basis of above findings, both areas were found to be equally effective when root planing was done in higher magnifications. DOM group was proved to be the best while unaided group was the least effective technique as far as the cleaning efficiency was concerned. Mandibular teeth were more efficiently managed as compared to maxillary teeth while anterior teeth were more efficiently managed as compared to posterior teeth. Buccal surfaces were most effectively cleaned followed by mesial, distal, lingual and least effective was palatal. Supragingival and subgingival SRP were equally effective when performed under magnification. Removal of supra and sub gingival plaque and calculus along with the reduction of inflammation is the most important factor and always a primary goal of periodontal therapy. Traditional techniques involve blind, closed subgingival SRP or a flap for access surgery. Numerous studies indicated the difficulty in removing these accretions to the point that histologic manifestations of chronic inflammation are eliminated. ,,, Deeper the pocket, the harder it is to instrument the area. EDAX results of the present study for levels of Mg and K showed that Group 1 had maximum levels followed by Group 2 and Group 3. However, for P and K, the order was just reverse with Group 1 showing minimal and Group 3 showing maximum values. For Ca and K, there was not much difference yet Group 1 had maximum value and Group 2 had minimum value. For Ca/P ratio, Groups 1 and 2 had very close values while Group 3 had minimum value. For Ca/Mg ratio, the differences were most evident, showing minimum value in Group 1 and maximum value for Group 3. 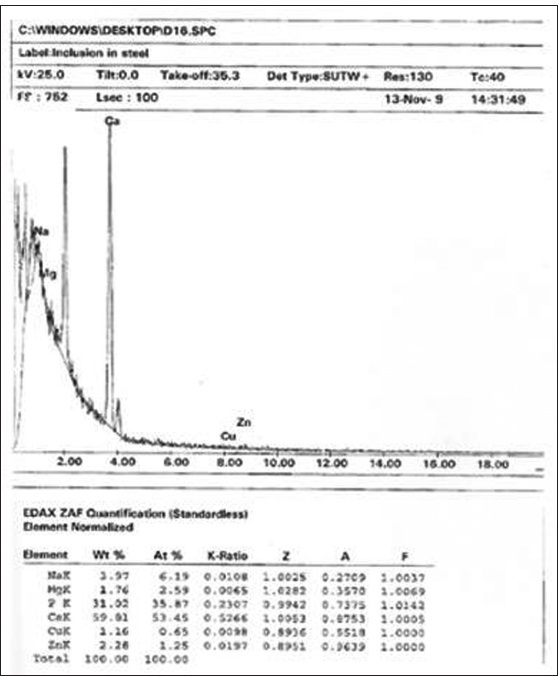 The most common elements detected on the root surface by EDAX, were P, Ca, Cu, Zn and Mg, while the few other elements detected, were sodium (Na), chlorine (Cl), K, aluminum (Al) and sulfur (S). It seems reasonable that there could be different elemental make-ups of hard tissue, even to the density and concentration of such constants as Ca and P. Concentrations did not vary to a great extent within the same root. Perhaps deep within the periodontal pocket, it is the organic phase of cementum that is affected by periodontal disease, but not the mineral phase as shown in various other studies. ,,,,, Presence of minerals such as Cu, Zn and Mg are normal inorganic structures found in cementum of diseased and non-diseased root. This observation is in consistent with findings obtained by Barton and Van Swol,  which stated that any differences in the elements concentration noted within the root structure could be due to the concentration of these ions in body fluids during tooth formation. It is also possible that the dietary intake and ion exchange after tooth eruption could be reflected within the roots. It was observed from the present study that magnification tools significantly enhance the efficacy of supra gingival and sub gingival SRP. Magnifying loupe with limited magnification showed better results than the unaided group. DOM proved to be the best aid in producing smooth root surface free of debris, calculus, scratches etc., and eliminating diseased cementum effectively. 1. Cobb CM, Drisko CH. Parameter on chronic periodontitis with slight to moderate loss of periodontal support. American Academy of Periodontology. J Periodontol 2000;71 Suppl 5:853-5. 2. Ivie M, Kardum, Jurak I, Troselj KG, Pavelie K, Aurer, et al. The effect of scaling and root planing on the clinical and microbiological. Parameters of periodontal diseases. Acta Stomatol Croat 2001;35:39-42. 3. Badersten A, Nilveus R, Egelberg J. Effect of nonsurgical periodontal therapy. II. Severely advanced periodontitis. J Clin Periodontol 1984;11:63-76. 4. Corbet EF, Vaughan AJ, Kieser JB. The periodontally-involved root surface. J Clin Periodontol 1993;20:402-10. 5. Daly CG, Seymour GJ, Kieser JB, Corbet EF. Histological assessment of periodontally involved cementum. J Clin Periodontol 1982;9:266-74. 6. Newman HN, Hardy JH. Middle zone of the root surface integument of human teeth affected by chronic periodontitis. J Clin Periodontol 1984;11:16-20. 7. Baker PJ, Roopenian DC. Genetic susceptibility to chronic periodontal disease. Microbes Infect 2002;4:1157-67. 8. Belcher JM. A perspective on periodontal microsurgery. Int J Periodontics Restorative Dent 2001;21:191-6. 9. Batista LH, Júnior JG, Silva MF, Tonholo J. Atomic force microscopy of removal of dentin smear layers. Microsc Microanal 2007;13:245-50. 10. Dibart S, Capri D, Casavecchia P, Nunn M, Skobe Z. Comparison of the effectiveness of scaling and root planing in vivo using hand vs. rotary instruments. Int J Periodontics Restorative Dent 2004;24:370-7. 11. Leknes KN, Lie T, Böe OE, Selvig KA. A correlation study of inflammatory cell mobilization in response to subgingival microbial colonization. J Periodontol 1997;68:67-72. 12. Leknes KN, Lie T, Wikesjö UM, Bogle GC, Selvig KA. Influence of tooth instrumentation roughness on subgingival microbial colonization. J Periodontol 1994;65:303-8. 13. Leknes KN, Lie T, Wikesjö UM, Böe OE, Selvig KA. Influence of tooth instrumentation roughness on gingival tissue reactions. J Periodontol 1996;67:197-204. 14. Kubinek R, Zapletalova Z, Vujtek M, Novotný R, Kolarova H, Chmelickova H. Examination of dentin surface using AFM and SEM. Mod Res Educ Top in Microsc 2007;11:593-8. 15. Ribeiro FV, Casarin RC, Nociti Júnior FH, Sallum EA, Sallum AW, Casati MZ. Comparative in vitro study of root roughness after instrumentation with ultrasonic and diamond tip sonic scaler. J Appl Oral Sci 2006;14:124-9. 16. Selvig KA. Biological changes at the tooth-saliva interface in periodontal disease. J Dent Res 1969;48:846-55. 17. Alvarez-Pérez MA, Alvarez-Fregoso O, Ortiz-López J, Arzate H. X-ray microanalysis of human cementum. Microsc Microanal 2005;11:313-8. 18. Eide B, Lie T, Selvig KA. 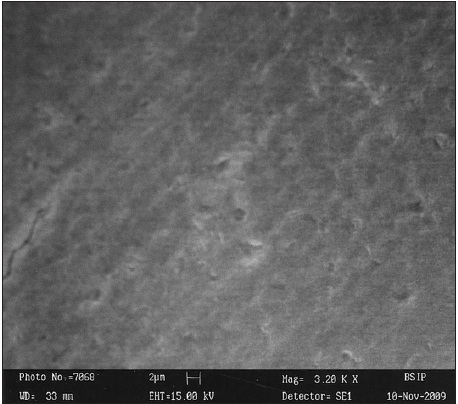 Surface coatings on dental cementum incident to periodontal disease. I. A scanning electron microscopic study. J Clin Periodontol 1983;10:157-71. 19. Neiders ME, Eick JD, Miller WA, Leitner JW. 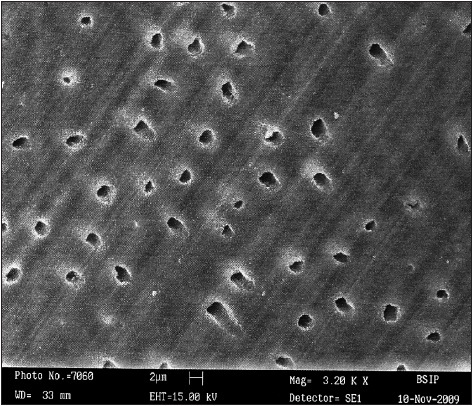 Electron probe microanalysis of cementum and underlying dentin in young permanent teeth. J Dent Res 1972;51:122-30. 20. Maidwell-Smith M, Wilson M, Kieser JB. Lipopolysaccharide (endotoxin) from individual periodontally involved teeth. J Clin Periodontol 1987;14:453-6. 21. Wirthlin MR, Pederson ED, Hancock EB, Lamberts BL, Leonard EP. The hypermineralization of diseased root surfaces. J Periodontol 1979;50:125-7. 22. Khounganian RM, Osman HI. Energy dispersive X-ray analysis of periodontally diseased and nondiseased human teeth using scanning electron microscopy. Egypt Dent J 2006;52:1455-65. 23. Barton NS, Van Swol RL. Periodontally diseased vs. normal roots as evaluated by scanning electron microscopy and electron probe analysis. J Periodontol 1987;58:634-8.